THE highest function of the healing art is not to cure the sick, but to keep people well. We need those who can cure disease. But even more we need those who can keep disease from manifesting. The more enlightened we become the more the healer’s duty and his fame will rest on keeping his clients in health. Instead of bragging about his cures, he will feel ashamed when his clients fall ill. He will base his claims to skill upon the fact that among those employing him there has not been an illness, nor a day’s work lost on account of poor health, during a certain number of years. Stellar diagnosis will aid this type of healer as nothing else will. For it not only indicates, from the birth chart, the predisposition toward diseases or difficulties of a particular type, but it also indicates, by the progressed aspects, the precise periods during which these predispositions are apt to develop into disease or difficulty. Whatever type of healing is employed, it is a decided advantage to know that during certain months and years, as revealed by progressed aspects, there is little danger of the natural weakness developing into disease. It is an advantage to know that an individual is quite immune from certain diseases, and will remain so throughout life. And it gives the healer a powerful advantage to know just when those periods are in the life—what weeks, months or years—during which there is danger from some particular type of disease. It enables Precautionary Actions to be taken to prevent the disease or other difficulty from developing. But whether the difficulty is already present, or as yet only threatening, a study of the birth-chart and progressed aspects should reveal the thought-cell groups which, because of the discord they feel, are working to bring the disease or other difficulty into the life. To do this they influence the thoughts, the behavior and the environment. The more favorable these become to the maintenance of the disease the less power they must possess to cause it to develop or continue. And if the already ill patient continues to think the same thoughts, eat the same foods, follow the same habits, and subject himself to the same environmental conditions, he is unlikely to retain his health even if the stellar healer is able to bring him temporary relief. In stellar healing there are five distinct steps. The first of these is stellar diagnosis. Then comes selecting the healing thoughts, educating the patient, the general health treatment, and finally the specific stellar treatment. As the inner-plane seat of the difficulty, whatever the difficulty may be, is a group or groups of thought cells which because of their discord have desires for conditions which are detrimental to the patient, the primary effort should be directed toward changing their desires so that they will work for health, or for whatever it is that the patient seeks. The desires of thought cells can be changed in the direction sought through conversion, through the application of mental antidotes, or through applying to them properly selected planetary or other astral energies. The method of conversion and selection and application of mental antidotes is explained in detail in Course IX, Mental Alchemy. It is the function of stellar diagnosis to reveal the chief thought-cell groups the desires of which must be changed if the patient is to recover or maintain good health. After the healer has decided which type of thought cells are chiefly responsible for the disease or other difficulty, he selects their mental antidote. He instructs the patient in the constructive use of thoughts of this type, he employs constructive thoughts of this type in giving the specific stellar treatment, and he tunes in on, and delivers to the thought cells of the patient during the specific stellar treatment, planetary energies of this type. In applying either thoughts or planetary energies, only those constructive should be employed, and they should always be delivered with a feeling of pleasure. SUN thoughts and planetary energies are employed to give positiveness and vitality to thought cells of other planetary types. MOON thoughts and planetary energies are employed to change the desires of discordant Mars thought cells. MERCURY thoughts and planetary energies are employed to change the desires of discordant Jupiter thought cells. VENUS thoughts and planetary energies are employed to change the desires of discordant Saturn thought cells. MARS thoughts and planetary energies are employed to change the desires of discordant Moon thought cells and discordant Pluto thought cells. JUPITER thoughts and planetary energies are employed to change the desires of discordant Mercury thought cells and discordant Uranus thought cells. SATURN thoughts and planetary energies are employed to change the desires of discordant Venus thought cells and discordant Neptune thought cells. URANUS thoughts and planetary energies may be employed to change the desires of discordant Jupiter thought cells. To tune in on these planetary energies the feeling to be induced is that of intense potentiality devoted to discovery and originality. It is the mood of inspiration. NEPTUNE thoughts and planetary energies may be employed to change the desires of discordant Saturn thought cells. To tune in on these planetary energies the feeling to be induced is that of sensitivity and keen awareness to inner-plane presences. It is the mood of extra-sensory perception. PLUTO thoughts and planetary energies may be employed to change the desires of discordant Mars thought cells. To tune in on these planetary energies the feeling to be induced is that of high potentiality conscious and functioning on the inner plane. It is the mood of conscious and directed inner-plane soul activity. In addition to thoughts of the mental antidote type, delivered during the specific treatment, the healer, during the general treatment gives oral and mental suggestions to the patient, and talks mentally to organs or tissues which are not functioning properly, while holding in his mind the image of the patient in perfect health. The thought cell discord which manifests as disease also tends to express itself through discordant thinking of the same planetary type. This type of thinking may take a wide variety of forms. If there are hindrances in objective consciousness to the recognition of the true desires back of it, it may express through not easily recognized substitute channels. And one task of the healer is to get the confidence of his patient sufficiently that he will talk about himself freely and reveal these habitual thought trends. When the trends that express the inner discord are discovered, the healer should instruct the patient, not only that he should, whenever these thoughts start to enter his mind, substitute pleasant thoughts of the antidote type, but how to train himself thus to substitute the antidote thoughts for those that were previously habitual. In addition to discovering the thoughts of the patient which express the birth-chart constant and progressed constant of the disease, the healer should take particular pains to discover if the patient has discordant thoughts about his personality or his health or about work or illness. Discordant thoughts about personality and health move at once into compartment one of the astral body and directly affect the health. Discordant thoughts about work or illness move at once into compartment six of the astral body and directly influence illness. For such discordant thoughts the patient should be instructed to substitute pleasant thoughts about his body and personality, and pleasant thoughts about his work. He should be shown not only that he should change his attitude toward these matters, but how to do it. To enable him to give such instructions, the healer should be thoroughly familiar with B. of L. Courses III, V, IX and XIV. The reconditioning of the patient’s thought cells, when successful, will cause them to desire, and work for, the things which the patient also desires. But for whatever they work—health or disease—that which they can accomplish depends upon the relation of their power to the resistance offered by environment. If facilities for health are present in the environment, the health-seeking thought cells need little power to attract health. If facilities for disease are not present in the environment it may be difficult for the most powerful discordant thought cells to develop disease. The patient, therefore, should be instructed relative to hygienic measures, including the foods he should eat, as revealed by the planetary affliction mapping his difficulty as shown by stellar diagnosis. What these foods are is explained in the five lessons on Stellar Dietetics—Nos. 153, 222, 223, 224 and 225. Physical cells and physical organs have a certain amount of intelligence. They know how to do certain things. And if their consciousness can be reached and impressed by the healer they will strive to do as he instructs. Their consciousness, as well as the unconscious mind of the patient, resides on the astral plane. They can be reached and impressed through the organic electromagnetic energy of the healer acting as the conductor of his thoughts. The healer should be thoroughly familiar with the power and use of suggestion, as explained in B. of L. Course V; and so express himself to his patient in words and actions that the patient will receive the suggestion that he will be healed. And throughout both the general treatment and the specific treatment he should hold in his mind the image of his patient in perfect health. Not only objectively, but also with his inner-plane self, he should desire and be determined that the patient shall and must gain the health thus imaged. When he knows that it will be beneficial for some group of physical cells or some organ to behave in a different manner, he can make passes over the region with his hands, saturating it with the electromagnetic energy flowing from his fingers, and speak to it mentally, not violently, but firmly, and tell it just what he wants it to do. The electromagnetic energy will convey his commands to the group or organ, and if he has inward (astral) confidence his orders will be carried out it will quickly respond. If the liver is sluggish, he can thus talk to it and tell it to become more active. If the heart is too active, he can talk to it firmly and ask it to slow down. He can tell the stomach to take more care in its handling of foods. He can talk to the nerves and brain and tell them to relax so the patient can get proper sleep. But before giving such commands he should be sure the action he asks will actually assist in restoring health. If, at any time during either the general or the specific treatment the electromagnetic energy does not flow abundantly from the healer’s hands into the patient, the healer should rub them briskly together, clench and unclench them rapidly, shake his hands vigorously, or adopt other means to cause a greater circulation of blood in his hands and the electromagnetic energy to flow more freely. Stellar treatments may be given while the patient is reclining by placing one hand under and the other hand over the part to be treated. And when the spine needs special attention this is the best position, as when the patient lies face downward the hands can be moved down the spine, one hand on either side of the vertebral column. Then when it is desired to direct the energies into the front part of the body, the patient can be turned on his back. Whether the patient sits or lies, his spine should be kept fairly straight and free from bends and strains that might hamper the passage of electromagnetic energy. Thin clothing, not of silk, is desirable, such as a cotton hospital gown. In the general treatment planetary energies are tuned in on, and then temporarily, only at station two, which is a place of storage for lunar constitutional electromagnetic energy, and station seven, which is a place of storage for solar vital electromagnetic energy. These energies are stored in these regions even as reserve fuel is stored in the liver, and reserve calcium is stored in the bones, to be drawn upon when most needed. 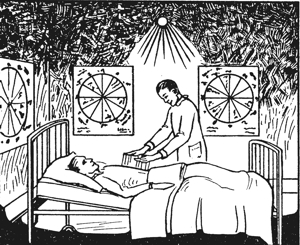 FIRST STATION: Standing at the right side of his patient, the healer places his right hand close to, or on the patient’s forehead, and his left hand on the back of his head, holding him in the image of perfect health while charging his brain with the electromagnetic energies which flow from each hand to the other. This should continue for about one minute. SECOND (MOON) STATION: The hands should be moved downward so that the right hand is just in front of, or touching, the larynx, and the left hand on the back of the neck close up against the base of the brain. Holding the consciousness of perfect health as the objective sought, the healer should tune in on, and thoroughly saturate the neck and base of the brain with the clear green planetary energy of the Moon and the soothing relaxing lunar electromagnetism. This should continue for about two minutes. THIRD STATION: The hands should be moved so that the right hand is on the upper chest and the left hand on the back directly opposite. Still holding the knowledge that the patient will be healed, this section of the body is charged with electromagnetic energy for about a minute. FOURTH STATION: The hands should be moved so that the right hand is on the lower chest and the left hand on the back directly opposite. Continuing the mental conception of health, this region should be charged with electromagnetic energy for about a minute. FIFTH (MERCURY) STATION: The right hand should be placed on the region of the solar plexus and the left hand on the back directly opposite. The healer, while charging this region, should concentrate on whatever corrections to the patient’s habits of thought seem most desirable. He should formulate these in words and mentally speak to the patient, telling him the type of thoughts he wishes him to cultivate. This thought-corrective treatment should last about two minutes. SIXTH STATION: The right hand should be placed over the navel and the left hand lower down on the back in the region of the sacral plexus. For about one minute this region should be charged with electromagnetic energy while the healer holds the conviction of perfect health. SEVENTH (SUN) STATION: The right hand should be placed on the patient’s left side over the spleen, which lies just under the heart, and the left hand on the back immediately opposite. The healer should then tune in on the orange planetary energies of the Sun, and while holding the thought of abundant vitality, thoroughly charge the spleen both with the planetary energies and the vital electromagnetism of the Sun. This should continue for about two minutes. SPECIFIC STELLAR TREATMENT: Next comes the specific treatment to be discussed in Chapter 6, Serial Lesson 202. Assuming the whole treatment to last half an hour, this permits 15 minutes to be devoted to the specific treatment. EIGHTH STATION: After the specific treatment has been completed, the healer again places his hands on the fifth (Mercury) station, the solar plexus, and repeats the treatment there as he gave it the first time, for about one minute. NINTH STATION: He then goes to the second (Moon) station at the back of the neck and base of the brain, and gives a final recharging with the clear green astral energies and the lunar electromagnetic energies for about a minute. TENTH STATION: As the last place of treatment he again goes to seventh (Sun) station, with his right hand over the spleen and the left hand at the back opposite, and for about three minutes pours the orange astral energy, and the vital electromagnetic energy into it. When the spleen is thus recharged with vitality, as the final act of the treatment he makes a little circular movement of his right hand above the spleen, sealing it with his thoughts so that the vitality will be retained for use. The power of the additional energy which is added to the normal power of the progressed horoscope by a given progressed aspect depends upon the average birth-chart power of the two planets involved in the aspect and the power of the aspect formed. The peak power of each of the ten major-progressed aspects is obtained by multiplying the average birth-chart power of the two planets involved in the aspect by the decimal fraction given in the TABLE OF PROGRESSED ASPECT PERCENTAGES at the end of this serial lesson. The decimal fraction (percentage of birth-chart power) shown in this table is obtained by multiplying the number of degrees given in the Table of Aspects and Their Orbs in Serial Lesson 197 by .05; giving the parallel the same power as the conjunction in that table, and giving Mercury the same power as if it were Sun or Moon in the same house. 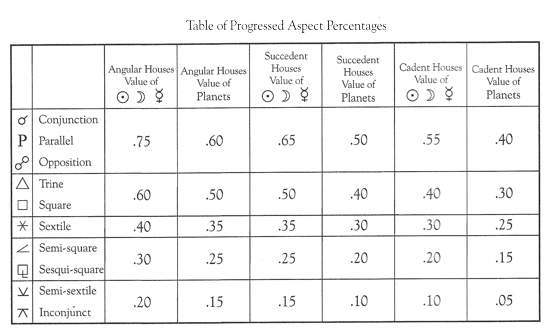 In using this Table of Progressed Aspect Percentages, the decimal fraction (percentage) indicated for the most powerful house occupied by either a progressed planet or a birth-chart planet involved in the aspect should be employed. The power of a major-progressed aspect of the Moon is obtained by calculating it as if it were a major-progressed aspect from one of the other planets and dividing the result by 7. The power of a minor-progressed aspect is obtained by calculating it as if it were a major-progressed aspect and dividing the result by 27.3. The power of a transit aspect is obtained by calculating it as if it were a major-progressed aspect and dividing by 365.25. When Mars or the Sun is involved, and at the same time there are other heavy progressed aspects which act as Rallying Forces, the event indicated by the progressed aspect occasionally takes place while the progressed aspect is as much as a degree and a half from perfect (Research shows that one degree is always valid.). This, however, forms an exception to the general rule that the effective orb within which the event indicated by a progressed aspect takes place is one degree from the perfect aspect. But at one degree from perfect, the aspect commonly is powerful enough to pick up about one-half the peak load of the aspect, gradually increasing in power until the peak is reached, then gradually decreasing in power until at one degree beyond perfect it picks up only about one-half the peak load. Beyond this one degree from perfect the aspect usually is ineffective. These findings are derived from statistical studies of progressed aspects in the charts of thousands of people at the time some significant event came into their lives. When a major-progressed planet makes an aspect to its birth-chart place there are only two terminals affected by the aspect. But as in the progressed horoscope each planet involved in the aspect has its birth-chart position and in addition its progressed position, except when a major-progressed planet makes an aspect to its birth-chart place every major-progressed aspect has four terminals. Minor-progressed aspects, and transit aspects, are made only to one or more of the terminals mapped by a birth-chart planet’s position or mapped by its major-progressed position. A minor-progressed aspect or a transit aspect, therefore, must have not less than three terminals. 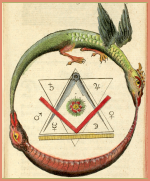 Whatever the power and harmony or discord of a progressed aspect—major, minor or transit—this full power and full harmony or discord is received by each of the two terminals actually forming the aspect, and is consequently added to the sign and house occupied by these two terminals. Each of the other terminals, and consequently the sign and house it occupies, receives, through the principle of resonance, one-half the power and one-half the harmony or discord of the progressed aspect, and this therefore is added to the sign and house occupied by such terminal. And in addition to signs and houses actually occupied by one or more of the terminals, through the principle of resonance each sign ruled by each of the planets involved in the progressed aspect, and consequently the house the cusp of which it occupies, receives one-half the power and one-half the harmony or discord of the progressed aspect. If the sign is intercepted it receives one-fourth the power and one-fourth the harmony or discord of the progressed aspect. In computing the harmony or discord of a progressed aspect the same three factors are considered as are employed in computing the birth-chart harmony or discord of an aspect. 1. With the exception of Mutual Reception (MR) the essential dignity of the planets involved in the progressed aspect is taken care of in calculating the normal harmony or discord of the major-progressed horoscope. In the progressed horoscope, Mutual Reception is only considered during the time the planets in mutual reception are within orb of a progressed aspect. A major-progressed aspect between planets which at the time the aspect is within orb are in mutual reception gains 2.50 harmodynes. 2. When Saturn is involved in a progressed aspect, one-half its power is made discordant by its nature alone. 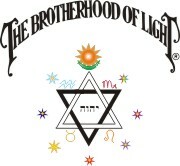 When Jupiter is involved in a progressed aspect, one-half its power is made harmonious by its nature alone. When Mars is involved in a progressed aspect, one-fourth its power is made discordant by its nature alone. When Venus is involved in a progressed aspect, one-fourth its power is made harmonious by its nature alone. 3. Except when modified by Saturn, Jupiter, Mars or Venus as indicated, the astrodynes of the discordant progressed aspects indicate the number of discordynes, and the astrodynes of the harmonious progressed aspects indicate the number of harmodynes. The three neutral progressed aspects—conjunction, inconjunct and parallel—while contributing power, do not contribute to harmony or discord except when Jupiter, Saturn, Venus or Mars is involved. When one of these four planets is involved in a neutral progressed aspect, one-half or one-fourth of the power of the progressed aspect is made harmonious or discordant according to the rule given above. Now let us calculate the peak power and the peak harmony or discord of some of the major-progressed aspects in the chart of John Edwards which are within orb during the year 1941. The birth-chart power of each planet is given in the grill in Serial Lesson 199, and the birth-chart harmony or discord is given in the grill of same SL, and the positions as given in the ephemeris on April 9, 1920, are their major-progressed positions for calendar date June 9, 1941. Progressed Saturn is sextile birth-chart Pluto perfect June 9, 1937. As birth-chart Pluto is in an angle the decimal is .35. The average power of Saturn and Pluto is 51.25. Multiplying 51.25 by .35 gives the peak power of the aspect as 17.94 astrodynes. As Saturn is involved we divide 17.94 by 2, which gives the peak harmony of the aspect as 8.97 harmodynes. This progressed aspect adds 13.46 astrodynes (one-half of 17.94 for Saturn ruling its cusp, and one-fourth of 17.94 for Saturn ruling the intercepted sign) to the major-progressed normal of 64.63 astrodynes of the second house; and 6.73 harmodynes (one-half of 8.97 for Saturn ruling its cusp, and one-fourth of 8.97 for Saturn ruling the intercepted sign) to the major-progressed normal of 1.53 discordynes of the second house. It adds 26.91 astrodynes (17.94 for birth-chart Pluto in the house, and one-half of 17.94 for progressed Pluto in the house) to the major-progressed normal of 111.22 astrodynes of the seventh house; and it adds 13.46 harmodynes (8.97 for birth-chart Pluto in the house, and one-half of 8.97 for progressed Pluto in the house) to the major-progressed normal of 22.19 harmodynes of the seventh house. It adds 26.91 astrodynes (17.94 for progressed Saturn in the house, and one-half of 17.94 for birth-chart Saturn in the house) to the major-progressed normal of 81.01 astrodynes of the ninth house; and it adds 13.46 harmodynes (8.97 for progressed Saturn in the house, and one-half of 8.97 for birth-chart Saturn in the house) to the major-progressed normal of 26.59 discordynes of the ninth house. It adds 8.97 astrodynes (one-half of 17.94) to the major-progressed normal of 82.09 astrodynes of the eleventh house; and 4.49 harmodynes (one-half of 8.97) to the major-progressed normal of 2.08 harmodynes of the eleventh house; the cusp of which Pluto rules. It adds 8.97 astrodynes (one-half of 17.94) to the major-progressed normal of 28.68 astrodynes of the twelfth house; and it adds 4.49 harmodynes (one-half of 8.97) to the major-progressed normal of 3.84 harmodynes of the twelfth house; the cusp of which Pluto rules. Progressed M.C. is parallel birth-chart Saturn September 4, 1940. As progressed M.C. is in the tenth house, the decimal is .60. The average power of M.C. and Saturn is 49.12. Multiplying 49.12 by .60 gives the peak power of the aspect as 29.47 astrodynes. Dividing 29.47 by 2 (because Saturn is involved) gives the peak discord of the aspect as 14.74 discordynes. Progressed Asc. is sextile progressed Uranus October 2, 1940. As progressed Asc. is in the first house, the decimal is .35. The average power of Asc. and Uranus is 30.79. Multiplying 30.79 by .35 gives the peak power of the aspect as 10.78 astrodynes. The harmony of the aspect is 10.78 harmodynes. Progressed Mars is sextile progressed Saturn November 27, 1939. As progressed Mars is in an angle the decimal is .35. The average power of Mars and Saturn is 47.30. Multiplying 47.30 by .35 gives the peak power of the aspect as 16.56 astrodynes. Dividing 16.56 by 4 (one-half off for Saturn, and one-fourth off for Mars) gives the peak harmony of the aspect as 4.14 harmodynes. Progressed Sun is semisquare progressed Uranus April 24, 1940. As progressed Sun is in an angle the decimal is .30. The average power of Sun and Uranus is 29.57. Multiplying 29.57 by .30 gives the peak power of the aspect as 8.87 astrodynes. The discord of the aspect is 8.87 discordynes. Progressed Mars is parallel progressed Saturn January 15, 1942. As progressed Mars is in an angle the decimal is .60. The average power of Mars and Saturn is 47.30. Multiplying 47.30 by .60 gives the peak power of the aspect as 28.38 astrodynes. Three-fourths of 28.38 (one-half for Saturn and one-fourth for Mars) gives the peak discord of the aspect as 21.28 discordynes. Progressed Mars is trine progressed Uranus October 20, 1943. As progressed Mars is in an angle the decimal is .50. The average power of Mars and Uranus is 45.48 astrodynes. Multiplying 45.48 by .50 gives the peak power of the aspect as 22.74 astrodynes. Dividing 22.74 by 4 (Mars involved) gives 5.69. 22.74 minus 5.69 gives the peak harmony of the aspect as 17.05 harmodynes. This progressed aspect adds 5.69 astrodynes (one-fourth of 22.74 as Aquarius is intercepted) to the major-progressed normal of 64.63 astrodynes of the second house, for Uranus ruling Aquarius in it; and 4.26 harmodynes (one-fourth of 17.05) for Uranus ruling the intercepted sign in it. It adds 34.11 astrodynes (22.74 for progressed Uranus plus 11.37 for birth-chart Uranus) to the major-progressed normal of 197.82 astrodynes of the third house; and it adds 25.58 harmodynes (17.05 for progressed Uranus plus 8.53 for birth-chart Uranus) to the major-progressed normal of 1.76 harmodynes of the third house; occupied by progressed and birth-chart Uranus. It adds 11.37 astrodynes (one-half of 22.74) to the major-progressed normal of 37.51 astrodynes of the fourth house; and it adds 8.53 harmodynes (one-half of 17.05) to the major-progressed normal of 3.66 harmodynes of the fourth house; the cusp of which Mars rules. It adds 22.74 astrodynes to the major-progressed normal of 129.39 astrodynes of the tenth house; and it adds 17.05 harmodynes to the major-progressed normal of 11.42 harmodynes of the tenth; house; occupied by progressed Mars. It adds 22.74 astrodynes (11.37 for birth-chart Mars in the house, and 11.37 for Mars ruling its cusp) to the major-progressed normal of 82.09 astrodynes of the eleventh house; and 17.05 harmodynes (8.53 for Mars in the house, and 8.53 for Mars ruling its cusp) to the major-progressed normal 2.08 harmodynes of the eleventh house; occupied by birth-chart Mars, and Mars ruling its cusp. It adds 11.37 astrodynes to the major-progressed normal of 28.68 astrodynes of the twelfth house, and adds 8.53 harmodynes to the major-progressed normal of 3.84 harmodynes of the twelfth house; the cusp of which Mars rules. Progressed Moon is square progressed Mercury February 23, 1941. As the Moon is in an angle the decimal is .60. The average power of Moon and Mercury is 31.66 astrodynes. 31.66 multiplied by .60 gives 19.00. Dividing 19.00 by 7 (because it is an aspect from the Moon) gives the peak power of the aspect as 2.71 astrodynes. This gives the peak discord of the aspect as 2.71 discordynes. This aspect adds 2.71 astrodynes to the major-progressed normal of 58.42 astrodynes of the first house; and 2.71 discordynes to the major-progressed normal of 7.47 harmodynes of the first house; occupied by progressed Moon. It adds 5.43 astrodynes (2.71 for progressed Mercury, 1.36 for birth-chart Mercury, and 1.36 for birth-chart Moon) to the major-progressed normal of 197.82 astrodynes of the third house; and 5.43 discordynes to the major-progressed normal of 1.76 harmodynes of the third house; occupied by progressed Mercury, birth-chart Mercury, and birth-chart Moon. It adds 1.36 astrodynes (one-half of 2.71) to the major-progressed normal of 111.22 astrodynes of the seventh house; and 1.36 discordynes (one-half of 2.71) to the major-progressed normal of 22.19 harmodynes of the seventh house; the cusp of which Mercury rules. It adds 1.36 astrodynes (one-half of 2.71) to the major-progressed normal of 133.41 astrodynes of the eighth house; and 1.36 discordynes to the major-progressed normal of 45.43 discordynes of the eighth house: the cusp of which the Moon rules. It adds 1.36 astrodynes to the major-progressed normal of 81.01 astrodynes of the ninth house; and 1.36 discordynes to the major-progressed normal of 26.59 discordynes of the ninth house; the cusp of which Mercury rules. Progressed Moon is square progressed Venus June 9, 1941. As progressed Moon is in an angle the decimal is .60. The average power of Moon and Venus is 29.52. Multiplying 29.52 by .60 gives 17.71. Dividing 17.71 by 7 (Moon aspect) gives the peak power of the aspect as 2.53 astrodynes. Dividing 2.53 by 4 (because Venus is involved) gives .63. 2.57 minus .63 gives the peak discord of the aspect as 1.94 discordynes. Progressed Moon is parallel birth-chart Pluto November 5, 1941. As progressed Moon is in an angle the decimal is .75. The average power of Moon and Pluto is 43.08. Multiplying 43.08 by .75 gives 32.31. Dividing 32.31 by 7 (Moon) gives the peak power of the aspect as 4.61 astrodynes. Relative to harmony the aspect is neutral. The peak power of a progressed aspect is a fair gauge of the importance of the main event or events attracted by it relative to the normal conditions in the same department of life, and the peak harmony or discord of a progressed aspect is a fair gauge of the fortune or misfortune of the main event or events attracted by it relative to the normal conditions in the same department of life. But the total effect of a progressed aspect on the life must take into consideration not only the peak power and the peak harmony or discord, but also the period of time during which the aspect exerts power and harmony or discord. If the planet or planets forming the progressed aspect do not vary in their rate of motion while the aspect is within one degree of perfect, the average daily power in astrodynes of a progressed aspect may be ascertained by multiplying its peak power by .75. This average daily power multiplied by the number of days, months or years the aspect is within one degree of perfect, gives the number of astrodyne days, astrodyne months, or astrodyne years representing the total effect of its power on the life. If the planet or planets forming the progressed aspect do not vary in their rate of motion while the aspect is within one degree of perfect, the average daily harmony or discord in harmodynes or discordynes of a progressed aspect may be ascertained by multiplying its peak harmony or discord by .75. This average daily harmony or discord multiplied by the number of days, months or years the aspect is within one degree of perfect, gives the number of harmodyne years or discordyne years representing the total effect of its harmony or discord on the life. An individual under a long-time progressed aspect to the ruler of the sixth house, having a moderate peak in discordynes, may never be bedfast a single day, but suffer ill health for years. Another individual, or the same individual at a different period in his life, may have a short-time progressed aspect to the ruler of the sixth house, having a high peak in discordynes, under which he is desperately ill in the hospital for a week or ten days, yet the whole illness last no more than a month. This short illness may stand out in his memory as a most serious event; but the long-time ill health, which he may overlook in trying to remember important events, may have detracted many times as much from his efficiency, and from his happiness. In John Edwards’ chart major-progressed Sun in 1941 is moving 59′ per year. As in the meantime Uranus moves 3′, the Sun travels 2 degrees 4′ while it is within one degree of semisquare progressed Uranus. That is, it moves 6′ more than its travel in 2 years. Using logarithms we find it takes 1 month, 7 days to travel this 6′. The aspect is thus within orb 2 years, 1 month, 7 days. We have already found the peak power of the aspect to be 8.87 astrodynes and the peak discord 8.87 discordynes. Multiplying 8.87 by .75 gives the average power of the aspect as 6.64 astrodynes, and the average discord of the aspect as 6.64 discordynes. Multiplying 6.64 by 2 gives 13.28 astrodyne years. Multiplying 6.64 by 1 gives 6.64 astrodyne months. Multiplying .28 (years) by 12 (months in a year) gives 3.36 astrodyne months. 6.64 plus 3.36 gives 10.00 astrodyne months. Multiplying 6.64 by 7 gives 46.48 astrodyne days, or 1 astrodyne month, 16.48 astrodyne days. 1 (month) plus 10 (months) gives 11 months. The total power of the aspect is thus 13 astrodyne years, 11 astrodyne months, 16.48 astrodyne days. And as the discordynes are the same number as the astrodynes the total discord of the aspect is 13 discordyne years, 11 discordyne months, 16.48 discordyne days. In John Edwards’ chart progressed Moon is moving 12° 51′ per year and progressed Venus is moving 1° 14′ per year. The gain of Moon on Venus is 11° 37′ per year. Working by logarithms shows that it takes the Moon 2 months, 2 days to gain 2 degrees on Venus. Thus progressed Moon square progressed Venus, perfect June 9, 1941, remains within orb 2 months, 2 days. We have already found the peak power of the aspect as 2.53 astrodynes, and the peak discord of the aspect as 1.94 discordynes. Multiplying the 2.53 by .75 gives the average power of the aspect as 1.90 astrodynes. Multiplying 1.94 by .75 gives the average discord of the aspect as 1.46 discordynes. Multiplying the 1.90 by 2 gives 3.80 astrodyne months. Multiplying 1.90 by 2 gives 3.80 astrodyne days. Multiplying .80 (months) by 30 gives 24.00 astrodyne days. 24.00 plus 3.80 gives 27.80 astrodyne days. The total power of the aspect is thus 3 astrodyne months, 27.80 astrodyne days. Multiplying 1.46 by 2 gives 2.92 discordyne months. Multiplying 1.46 by 2 gives 2.92 discordyne days. Multiplying .92 (months) by 30 gives 27.60 astrodyne days. 27.60 plus 2.92 gives 30.52 astrodyne days. The total discord of the aspect is 2 discordyne months, 30.52 discordyne days. Multiply one-half the peak power of the aspect by the number of minutes the aspect is from perfect and divide the product by 60. This gives the variation in power due to the number of minutes the aspect is from perfect. Subtract the number so found from the peak power. The number so found is the power of the aspect in astrodynes on the given date. To find how far from perfect a major-progressed aspect is on a given date, convert the calendar interval from the Limiting Date in the calendar year into EGMT Interval by multiplying the months by 2 and calling the product hours, and multiplying the days by 4 and calling the product minutes. Then on the Major Progression Date in the ephemeris representing the calendar year, calculate the sign and degree and minute of the progressed planet, or planets, for the EGMT Interval just as they are calculated in erecting a birth chart. This will show the major-progressed position, or positions, on the given date. The difference between the degree and minute thus shown, and the degree and minute of the perfect aspect, is the distance the aspect is from perfect. RULE: After the power of the aspect on the given date has been found, use this power—not including its stepped up power due to the reinforcement effect of a minor-progressed aspect on that date—as if it were the peak power of the aspect. Let us assume that on his twenty first birthday John Edwards was expecting, if some transaction worked out as he wished, to make a very large sum of money, and it was desired to know the power and harmony of all influences on that date affecting the second house. The second house is selected for this example work because there are an extraordinary number of progressed aspects influencing it on that date, and because the house holds both an intercepted sign and a planet at birth. 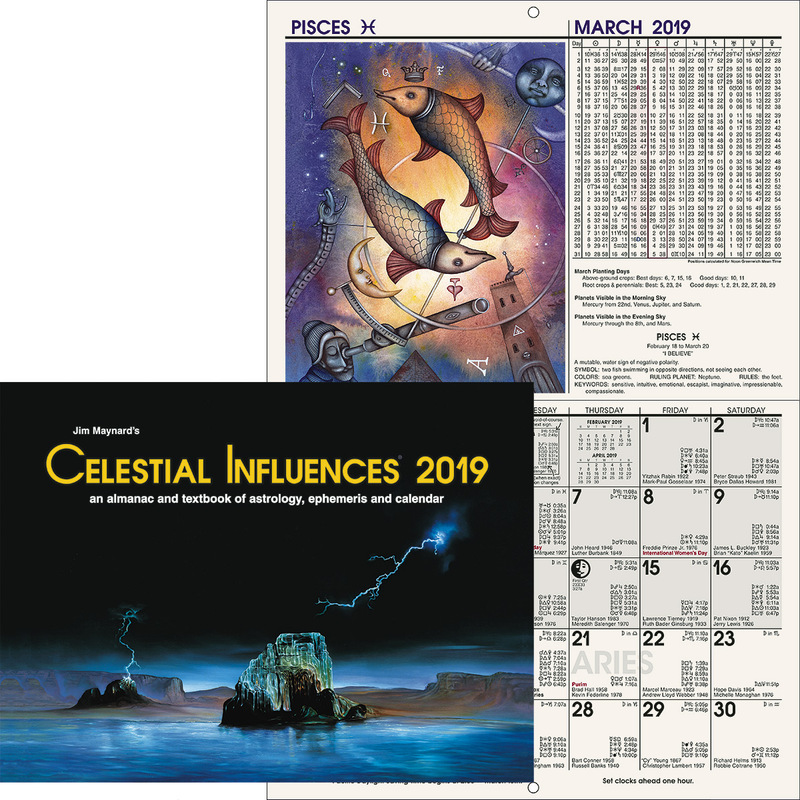 The Major Progression Date for 1941 for the John Edwards’ chart is ephemeris date April 9, 1920. As the Limiting Date in the calendar year is June 9, we subtract March 19 from June 9 and get 2 months, 20 days. Multiplying 2 by 2 gives 4 hours. Multiplying 20 by 4 gives 80 minutes. Total 5 hours, 20 minutes. The major-progressed positions of all the planets on March 19, 1941, can be found by using a minus EGMT Interval of 5 hours, 20 minutes, on April 9, 1920. Their positions as thus found are given on page . Comparing these positions with one another, and with the birth-chart positions, will reveal all planets within one degree of perfect aspect, and how many minutes each aspect is from perfect. 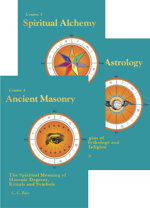 To include all major-progressed influences affecting the second house, in addition to the power and harmony of the major-progressed normal of 64.62 astrodynes and 1.53 discordynes (see Chapter 4, Serial Lesson 200), the power and harmony or discord of all major-progressed aspects within orb (including the parallels, which because such long-time aspects become a normal for the period) involving Saturn, Uranus and Venus must be computed. Thus, to make the second house major-progressed picture complete, although only the short-time high-peak aspects may be expected to indicate events deviating from the normal for the period, the power and harmony of 21 different major-progressed aspects must be computed. Sun semisquare birth-chart Uranus. We previously found the peak power of this aspect as 8.87 astrodynes. It is 56′ from perfect. Dividing 8.87 by 2 gives 4.44. Multiplying 4.44 by 56 gives 248.64. Dividing 248.64 by 60 gives 4.15. 8.87 minus 4.15 gives the power of the aspect on March 19, 1941, as 4.72 astrodynes. The discord is 4.72 discordynes. Progressed Mars sextile progressed Saturn. We previously found the peak power of this aspect as 16.56 astrodynes. It is 20′ from perfect. Dividing 16.56 of by 2 gives 8.28. Multiplying 8.28 by 20 gives 165.60. Dividing 165.60 by 60 gives 2.76. 16.56 minus 2.76 gives the power of the aspect on March 19, 1941, as 13.80 astrodynes. Subtracting one-half of this for Saturn, and one-fourth for Mars, gives the harmony as 3.45 harmodynes. Progressed M.C. parallel birth-chart Saturn. We previously found the peak power of this aspect as 29.47 astrodynes. It is 11′ from perfect. Dividing 29.47 by 2 gives 14.74. Multiplying 14.74 by 11 gives 162.14. 162.14 divided by 60 gives 2.70. 29.47 minus 2.70 gives the power of the aspect on March 19, 1941, as 26.77 astrodynes. 26.77 divided by 2 (because Saturn is involved) gives the discord as 13.39 discordynes. The power and harmony of all 21 major-progressed aspects affecting the second house on March 19, 1941 are given in the table below.